Follow the manufactures manual to see what the requirements for service and maintenance are, to keep your scooter/buggy in good working condition. This will also be required to validate any warranty you may have. (Help my mobility, 2010). Keep your scooter or buggy as dry as possible - this will help prevent rust. In wet weather it's a good idea to have protective covers for yourself and your scooter or buggy to stay dry. Storage covers are handy for keeping the dust and rain off your scooter or buggy whilst not in use. Scooter stores have a more rigid frame and will stand up to being left out in more adverse weather conditions. These stores also have security features so that you can keep your scooter or buggy safe. (DLF, 2010). 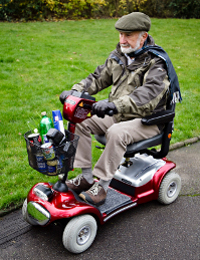 It is important to look after your mobility scooter or buggy battery. They will either be sealed lead acid or gel based and require charging after any significant use. Batteries need to be charged regularly to keep them working efficiently. Always adhere to the battery manufacturer's guidelines; they typically recommend charging for between 8 and 10 hours at a time. During cold weather and when the scooter is not in use, the batteries will gradually loose their charge and could decay if they are left in a discharged state. You should therefore be especially vigilant about keeping them charged during the winter months. 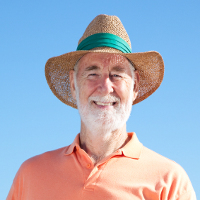 Always make sure you have enough battery power for your trip before you set off! Don't forget that travelling up hills and using your lights will use up more battery power. Pneumatic tyres are pumped up with air, and can be punctured. If you are using pneumatic tyres, regularly inspect them for punctures and wear and tear. Punctures can sometimes be repaired without needing a whole new tyre. Pneumatic tyres may provide a smoother ride. Solid tyres cannot be punctured, but often mean that you feel the ride is harder - you may feel more jolts as you go over stones or kerbs. (Help my mobility, 2010). However, it may make it easier to manoeuvre on some surfaces. Filled tyres are puncture-proof. They are a compromise between solid and pneumatic tyres. They are made of an open cell rubber compound to help with shock absorption. Deep tread tyres are available with different levels of tread. The deeper the tread the greater the grip and stability on kerbs, slopes and other difficult terrain. Many of the key working parts of a mobility scooter are hidden beneath the body shell and require specialist knowledge and tools to access. (Help my mobility, 2010). 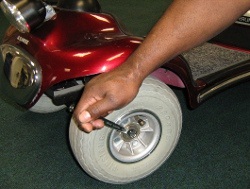 It is important to remember that a mobility scooter still has critical safety elements such as brakes which need to be checked. This is even more important on class 3 scooters that are used on the road at higher speeds. It is widely considered that class 3 mobility scooters may soon be subject to legislation that will require annual MOT style checks. Therefore, it is important to keep up to date with maintenance and routine checks. (Help my mobility, 2010).